Gap trading is one of the most common tools used by institutional traders due to the high probability of winning trades. It is a well-known concept in trading, however, the methodologies of gap trading are less well-known. This course shows you how to determine when gaps occur on a price chart and then shows two methods of actually trading the gap. If you are looking for a solid strategy to start stocks trading, then the Gap trading method is a good place to start, because it also trades on a daily time frame – great for beginners who want a relatively easy entry, at a slow pace, into stocks trading. In the second module you will learn the advanced Gap strategy. 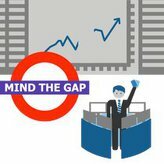 The advanced Gap strategy gives you a further insight into the techniques used by institutional traders that takes into account the market psychology and exhaustion patterns.